Beaver Valley Glassworks showcases the original work of Canadian glass blower and painter Tanya Zaryski. 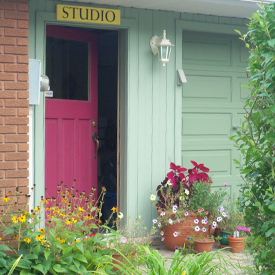 After operating a hot glass studio in the Beaver Valley near Kimberley, Ontario she has recently moved her studio to nearby Clarksburg. Scaling down her operation, Tanya is focused on painting and sculpture, and renting studio time offsite to create one of a kind glass functional and sculptural works. 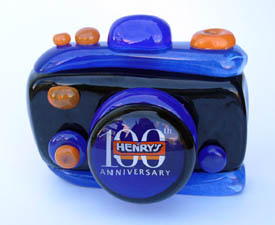 Commissions in all mediums are always considered, including corporate gifts and awards. 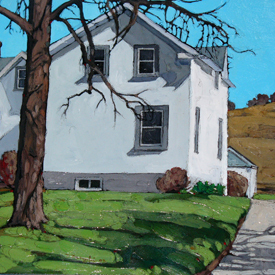 The home gallery and studio in Clarksburg is located at 127 Hill Street, and always open by chance or appointment. Tanya Zaryski is well known for her paintings of the Ontario landscape. Textural and detailed they capture an emotional realism representative of the countryside. Tanya works with hand blown and shaped hot glass to make functional and sculpture pieces. She makes objects that are useful and unashamedly beautiful. 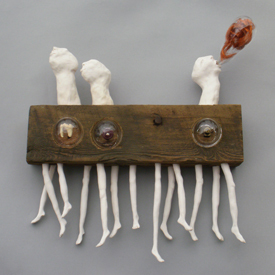 Utilizing clay, glass, metal wood and found objects, Tanya creates an array of sculptural objects for the wall or table. Unusual in their suggested narratives they intrigue the viewer and invite a dialogue.